Carte de visite (CDV) measuring just under 2.5 x 4 inches. Photographer is Schoonmaker of Troy, New York. There is some penciled writing under the image that is damaged to the point of illegibility, so I don’t know if it would have been helpful to be able to read it. Otherwise undated and unidentified. She looks like a doll in her precious dress, dwarfed by the larger furnishings. Perhaps somebody with more expertise can give an opinion, but I’m guessing this is from around the 1860s-70s. Does that seem right? I guess she’s standing on a low stool, but the effect is almost as if she’s floating in the air. At first glance I wondered if she was a little person rather than a child, but I guess that’s just because of the adult-ish outfit. 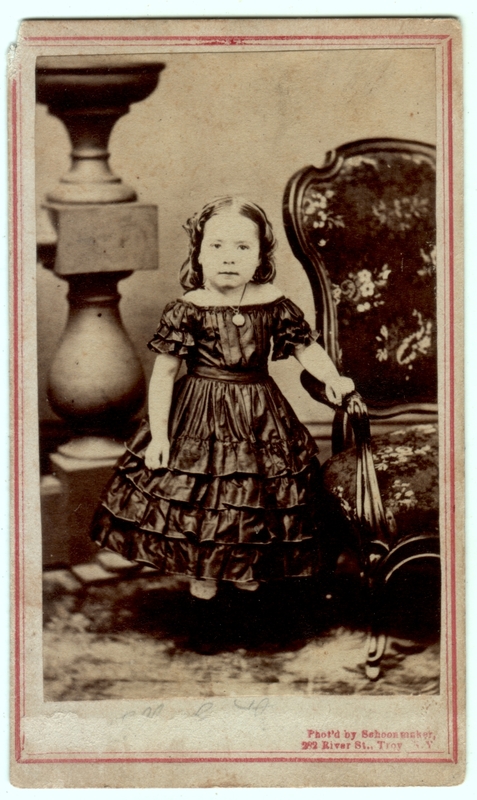 The pedestal and vase in the background is raised on a block, almost as if the photographer is deliberately making the child look smaller. That crossed my mind, too, wondering if she was a little person rather than a child. I’ve been surprised in the past by how grown-up some of the girls’ dresses were in those days, including things like exposed shoulders that seem inappropriately racy to our modern eyes. I agree the perspective seems deliberate, like the effort was being made to make her seem more delicate. It’s early 1860’s. I always enjoy when you post a photo! I collect them too! So weird looking — I’m trying to picture this little head over a My Little Pony t-shirt and a pair of jeggings with sneakers and I cannot see it. I haven’t checked back in for a while (neither have you, keep posting!) and these are all fun and mysterious and haunting. Hi Libby! Thanks for visiting again. Yes, I’ve been rather lax lately, but there are still photos to post when I’m back in the mood. I agree, it’s often interesting to try to imagine these vintage people in modern settings and clothing, especially children like this. And you’re right, her face is rather haunting.